Dr Marik received his medical degree from the University of the Witwatersrand, Johannesburg, South Africa. Dr Marik did a Critical Care Fellowship in London, Ontario, Canada. Dr Marik has worked in various teaching hospitals in the US since 1992. He is board certified in Internal Medicine, Critical Care Medicine, Neurocritical Care and Nutrition Science. 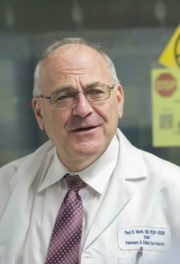 Dr Marik is currently Professor of Medicine and Chief of Pulmonary and Critical Care Medicine, Eastern Virginia Medical School in Norfolk, Virginia. Dr Marik has written over 400 peer reviewed journal articles, 80 book chapters and authored four critical care books. He has been cited over 35 000 times in peer reviewed publications.